I’ve been off the blog for a while but I have lots of projects on the go and I’m going to have to park some for a few months so this is more a note-to-self so I can catch up in Spring. It’s a minimal sequencer using an AVR but it’ll have a lot of strange features for experimentation. After this video I was hoping to crack on with the software to get the polyrhythmic/phasing functionality working but there are a few fundamental hardware issues to sort out first. I’ve found a better LED driver solution and I want to put decent comparators on the inputs. On hold for now but watch this space! Latest schematic after trying to reduce distortion in the circuit. I’ve added a volume control, proper biasing of signals from the AtTiny, an active 2-pole filter which gives a really clean output, and a massively minimised output stage which is good enough for testing with headphones. My analogue electronics is hit and miss so these values have been found experimentally. The volume control is part of the biasing circuit. In previous circuits I was saturating the PWM signal into the op amp causing it to clamp to it’s full possible range. This was great in theory but in practice working at full range caused distortion at the limits; there was noise on the top and flattening out of the signal at low frequencies. With the circuit operating at 5v the new biased signal going into and coming out of the TL072 is between 1.5v and 3v, giving enough tolerance for a clean signal. This is enough voltage to drive the transistor directly, so it runs unbaised with a 10k resistor to convert this to a base current. The component values are borrowed from this excellent three transistor headphone amp. The low pass filter part is taken from this excellent example. It might be cutting off the high frequencies a little too soon but I’ve left this in so the high sounds are not too piercing. The nice part about this configuration is that’s a neat footprint on protoboard/breadboard as the two caps sit neatly right next to the op amp (15nF going left from pin 2, 33nF going right from pin 3). This is more a note-to-self for breadboarding future versions, and also why I’ve drawn the circuit including the chip pinouts. FILTER_NOISE(13, 12)  // each sample. AVG_NOISE(3, 2, 4)    // samples. An update whilst getting the drum synth code together. The output is 8 bit at 31.25kHz, a frequency derived from the 8Mhz clock speed divided by 256 – the number of clock cycles it takes for the PWM ramp to go full cycle. // PWM output on PORTB0 = pin 5. _BV(COM0A1) |           // Clear OC0A/OC0B on Compare Match. _BV(WGM00) |_BV(WGM01); // Fast PWM, top 0xff, update OCR at bottom. TCCR0B = _BV(CS00);       // No prescaling, full 8MHz operation. // 8 bit playback at 31.25kHz. Not the most cutting edge audio player, 8 bit and no fast buffering of any kind but good enough for now. The sample generation code is tricker than expected; using an ATTINY45 means that efficient multiplication is not an option I’m in bit-hacking domain. The drum runs from 5v but for project completeness sake I put it in a box with a 9v battery. The leftmost two pots control sound parameters with the third controlling volume. The piezo picks up finger impacts from the outside so you can play the drum by tapping the tin. From left to right the circuit goes: 9v to 5v regulator, ATTINY45 synth (with a header around chip for in-circuit programming), filtering & pre-amp, power amp. Circuits always seem to end up denser when I actually build them – it was a cram getting all this onto protoboard. The actual circuit is pretty neat but the rats’ nest of cables is from hooking everything up to switches. I also had to shoehorn more caps in than expected. It would have been wiser to choose a bigger box and measure/mark out all the controls rather than faff around with files and a hole-borer, but I learned a lot for the next build in the process. Notably: I’ve never experienced dry solder joints before but the analogue stage of this circuit really highlighted them, I’m used to using strip board and not this sort of protoboard so I need a bit of practice here; the piezo does all manner of weird stuff when the metal side is against the inside of the tin, grounding issues; the whole circuit could be shuffled to the right – squeezing the battery in was a relatively last-minute decision. Paint job required. I’m still running this with the original software from my rhythm piano and I want to add more range to the sounds. The next post will have the first ‘official’ code release in which I’d like to include some lovely abrasive glitchcore modes I discovered whilst this circuit was playing up. These saturate the first unity gain op amp to generate a PWM signal with a range of 1.6v to 4.3v. The resistor after the low pass filter is much bigger, 1M so it doesn’t load the filter and screw up the signal. The second op amp gain is fixed at -0.5 (inverting 470k/1M). This gives a nice clean signal for the transistor. The level adjust is now just a linear pot over the second op amp output. Because the output level adjust pulls down to ground, a reduced signal is much lower so the transistors draw less current. Now the Instead of always draining a constant 80mA the circuit now drains 20mA at low volume up to 80mA for absolute max. The rightmost pot is the level control for the drum – the leftmost two are parameters which will plug into the ATTINY45. The leftmost switch is the power, the middle one select output on the amplifier or direct from the TL072 (not quite sure how to wire this up yet), the final switch selects whether the output is stereo/mono. A few weeks ago I improvised a circuit to make drum sounds for my rhythm piano that I showed at BEAM Day at Brunel University. Coding the synth was fun but getting the analogue electronics working was a baptism of fire; there was all sorts of system noise and I hastily threw in a low pass filter using totally the wrong component values… turns out most of my circuit was turning battery power into heat. Using fast PMW on the AVR Tiny45 gives 8 bit at approximately 40kHz. I’m using the chip’s internal 8Mhz RC resonator as a clock. For now the chip just sends out a constant sine wave for diagnostics. The final version has two pots controlling sound parameters and a piezo input as the drum trigger. The output PWM is 0-5v. 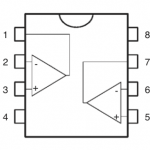 Potential divider converts the 0-5v range to 2.5-5v. This preps the signal for the first op amp where it saturates the buffer; using the full 0-5v range does funny things to the TL072 – it seems to stay at 5v with little spike signals. One half of the TL072 is used to buffer the signal, the voltage saturates the op amp giving an output of 1.5-4.5v PWM signal. 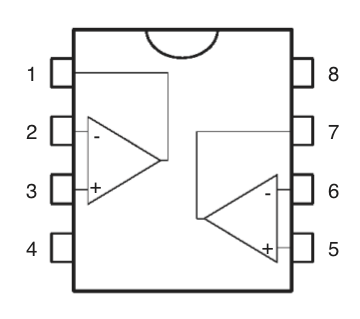 A low pass filter converts the PWM signal into an analogue signal. The analogue signal is biased and levelled for the power stage. A push-pull power stage boosts the signal so it’s powerful enough for the headphones. This sits at around 1v, which I think makes this a class A amplifier; minimal distortion but a bit power hungry. This is the part of the circuit which needs reviewing. 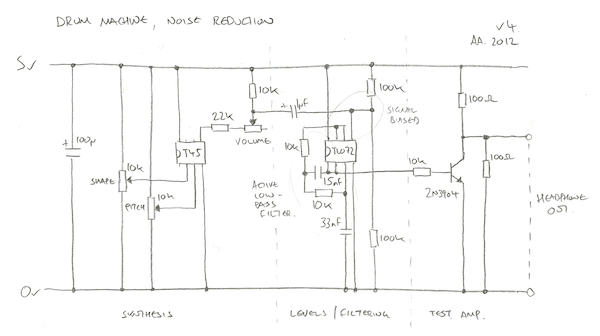 Looking at my notes here, I think I’ve made an error with the 2.5-5v divider at stage (2) – the values should be different. I’ll check this before the next post where I build the circuit and test the drums. The circuit in action. Yellow scope is filtered signal, red scope is output from power stage. Presently the whole circuit soaks around 80mA.